One of the most common questions that we hear from researchers is, “When will this document be declassified?” (sometimes expressed more plaintively as, “Why isn’t this document declassified yet?”). Even for seasoned researchers, security classification can seem mysterious and opaque and hint of governmental cover-up or paranoia. To dispel some of this mystery, our Declassification Unit describes below the process through which classified documents are opened to the public. In response to years of complaints from the public, combined with the legitimate need to balance open government with national security, President Clinton signed Executive Order (EO) 12958 in 1995. In essence, the order mandated the automatic declassification of all information 25 years or older, subject to very narrow exceptions. As a result of EO 12958, all National Archives facilities were required to: undergo comprehensive reviews of their holdings; implement plans for declassifying materials; and act on all declassification decisions. In the case of the Kennedy Library, the EO proved daunting, as it required us to review over one million pages of documents and more than 200 hours of tape recordings*. Regardless, we forged ahead with the work for the next decade-and-a-half. At present, we await determinations on approx. 300,000 pages of documents and have about 20 hours of tape recordings left to review. In the interim, the original EO was superseded by two subsequent orders, the last of which (EO 13526) currently guides our work. The concept of “declassification review” requires explanation. The Kennedy Library’s Declassification Unit spends its time on what are known as “mandatory reviews” (MRs) and “systematic reviews.” The term systematic review means just that: the review of a collection from start to finish, document by document or tape by tape. During the review process, staff members apply declassification guidelines furnished by the government agency (or agencies) that created the documentation; most of these agency guidelines were issued in the early 1990s. 1) Information restricted by the donor’s deed of gift and/or by laws protecting personal privacy. Less than 1% of material reviewed by the Declassification staff is related to privacy concerns. 2) Information restricted due to national security concerns. This information, the bulk of the Declassification Unit’s work, is divided into three broad categories: a) Intelligence information; b) nuclear weapons information; and c) information about or from foreign governments. Using government agency guidelines, Declassification staff members review every item and determine whether a particular subject or piece of data is still considered to be national security-classified information. If not, the document or tape is stamped “Declassified” and placed in the open collections for researcher use. If the material remains potentially sensitive, a staff member will submit a copy of the document to the agency or agencies that created the document or have what is known as “equity” in the document. “Equity” is a metaphor borrowed from the financial sector and, in this context, means that an agency is interested or invested in the outcome of a document. Every agency with equity in a document will review it to determine its final disposition. If the decision is to keep the document closed, a staff member will create a withdrawal sheet (pink) and place it in the folder from which the item was removed. The withdrawal sheet provides researchers with a general description of the withdrawn item, including the date it was most recently reviewed. These withdrawal sheets provide the basis for the mandatory review (MR) process, in which researchers request reviews of individual classified documents. The Kennedy Library’s mandatory review process has been in place since the early 1970s; based on information provided on the withdrawal sheets, researchers complete mandatory review request forms and submit them to Research Room staff. From that point forward, the mandatory review is coordinated by the Declassification Unit. The review steps are the same as those for a systematic review; any material that staff is unable to open in-house is sent to relevant agencies for equity review. Since the majority of MRs require submission to agencies, the timeliness of responses to researchers will vary, though the implementation of the declassification EOs has dramatically improved agency response times. Another term frequently used in the declassification world is “RAC” (Remote Archives Capture). 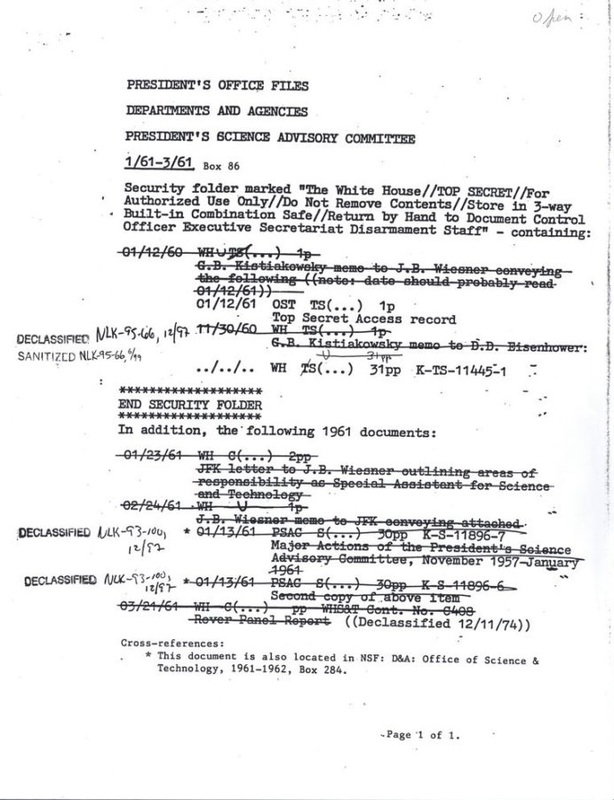 The Remote Archives Capture project was begun in the 1990s to facilitate the coordination of agency equity reviews in the face of new pressures instituted by the declassification EOs. The overall goal was to speed up declassification by centralizing the review process. The Kennedy Library was selected as the project’s pilot site; a RAC team visited the Library three times to scan its classified documents. The scans were then reviewed by equity holders, who then coordinated the final decisions. When all reviews were completed, materials were returned to the Kennedy Library for final review and opening, where possible. As the pilot site for the RAC project, the Kennedy Library helped to identify and troubleshoot problems with the RAC review process. For example, Declassification staff members observed that documents that had been previously sanitized (that is, closed in part) remained so in spite of updated declassification guidelines. Furthermore, staff had difficulty determining which agencies had reviewed an item (other than the agency for which the document was scanned). Perhaps, most importantly, were reviews involving the Department of State. Approx. 75-80% of all of Kennedy Library documents contain State Department equity, however, the agency did not participate in the original RAC project. As a result, Declassification staff members were still required to review most documents even if reviewed by other equity holders. Over time, the RAC process was greatly improved; overall, it has succeeded in expediting the declassification review process, particularly for later reviews of material. The declassification process can be puzzling to researchers and we work diligently to demystify it. Our job is to liaise between researchers and agencies in the service of making information available as quickly and efficiently as possible. Over time, the American public is accessing more and more historical information at a faster pace thanks to the three executive orders signed by Presidents Clinton, Bush and Obama. We are confident that this process will continue into the foreseeable future. *Note: John F. Kennedy was not the only president to record Oval Office conversations, but his recordings have been of particular interest to the public. 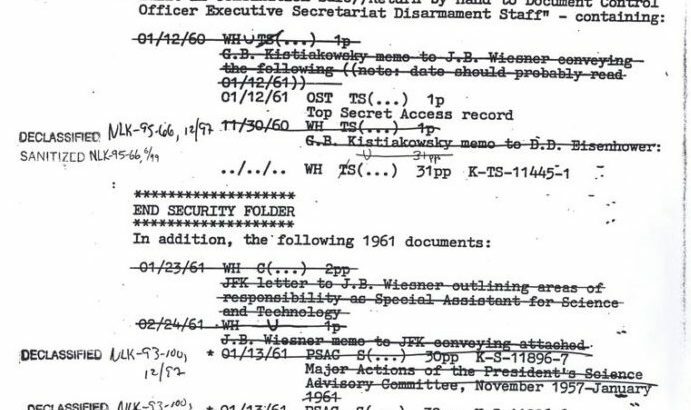 For this and other reasons, the presidential recordings represent a significant portion of the Kennedy Library’s declassification work. They will receive their own blog post in the future.